A DECADE IN THE MAKING! 30 PAGES OF LINER NOTES! The finest rock songs from 1980s cinema, guaranteed to send you straight to the gym and give you muscles of steel. 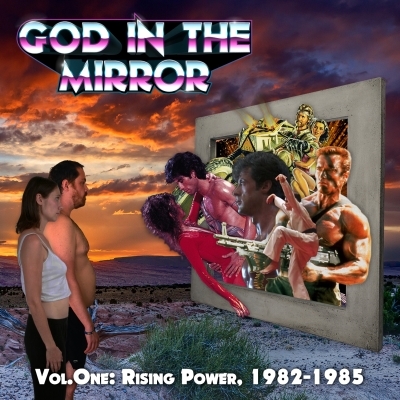 Welcome to “The God In the Mirror.” Your first question is probably what the title refers to and that is you, my friend. You are the god in the mirror. Why? Well, because the 1980s were a unique time for American cinema and this great nation in general. For most of the decade we could feel Communist USSR breathing down our necks (or so we thought). It’s rather quaint to recall it now, with the great Soviet bear just a memory, but there were times when nuclear annihilation seemed just around the corner. If you go back now and examine the films, television and books of the era you see it everywhere. Paranoia and fear were the order of the day and the American Action Movie was born anew from the womb of President Ronald Reagan. None of the action films from the 1980s could have succeeded quite so well if it weren’t for the music. Hard-rocking vocals near the upper limits of human hearing, squealing guitar solos, a pounding drum beat, and those lyrics…sweet Jesus, the lyrics! The finest examples of the era (featured here) speak directly to the listener, goading him to start pummeling his problems into submission. Eschewing proper grammar and logic in favor of testosterone, these songs have come to be known as “You Songs” by me and my friends. They address the listener directly like a badass sermon from the pulpit of pain. Check out the lyrics and your questions will all be answered. Assembled here in this collection are the best of the best, a batch of headbangers meant to move you to action. They are songs to inspire you to shrug off defeat and fight for your country, your life, and the possibly fictional American dream of being “a winner.” Whether these are legitimate aims is for you the listener to decide. I warn you though: when I first started this project I was a quiet, unassuming guy with little drive and no prospects. Now I’m an unstoppable force, crushing those who get in my way and bedding people by the score, all in the name of Me. Hetero ladies and lesbians, gay men and my trans sistren and brethren, I encourage you to listen too! The power exists in every one of us. It’s up to You to use it. GET IT NOW AND GET PUMPED!